The Nesco HP-9 "How to Dry Foods" is a cookbook written by home economist Deanna DeLong. 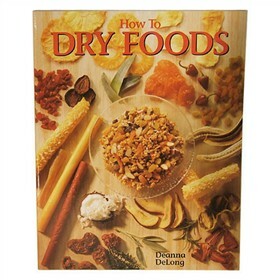 This cookbook features 160 pages with complete recipes for drying foods along with hint and tips. The book has a several sections on fruit, fruit leathers, vegetables, herbs & spices, nuts & seeds, meat, and fish. It also covers history, methods, and equipment for drying foods. The Nesco HP-9 has many exciting features for users of all types. The Nesco HP-9 is sold as a Brand New Unopened Item.